New York Rangers President and General Manager Glen Sather announced today that the club has agreed to terms with goaltender Martin Biron. Biron, 32, has surpassed the 20-win plateau in five of his 10 NHL seasons and has reached the 30-win mark twice, including a 31-win campaign in 2001-02. He has appeared in 462 career regular season games with the Buffalo Sabres, Philadelphia Flyers and New York Islanders, posting a record of 208-176-25-24, along with a 2.63 goals against average, a .910 save percentage and 26 shutouts. 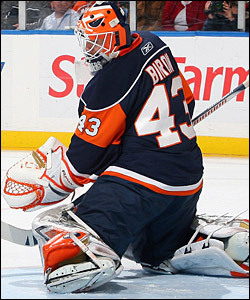 Goaltender Martin Biron has been particularly sharp against the Atlantic Division throughout his career and was the No. 1 neminder for Philadelphia in the team's run to the 2008 Eastern Conference Finals. Biron has registered a 50-40-8-4 mark with a 2.63 goals against average, a .910 save percentage and six shutouts in 104 career appearances against Atlantic Division rivals, New Jersey, New York Islanders, Philadelphia and Pittsburgh. The 10-year NHL veteran established career-highs in games played (72), total icetime (4,085), wins (31) and goals against average (2.22) during the 2001-02 season while backstopping the Buffalo Sabres. Biron ranked second in the NHL that season in games played, third in total ice-time (4,085), tied for ninth in save percentage (.915), and 10th in wins and goals against average. His 72 appearances tied the Sabres' record for games played in a single season at the time, and his 31 wins tied for fifth on the team's all-time list. In 2007-08, Biron established a career-high with a .918 save percentage and tied his career-high with five shutouts (1999-00), which tied for sixth in the NHL. Earlier that season, he became the first Flyers' goaltender in six years to record back-to-back shutouts (October 16 vs. Atlanta, 31 saves; October 18 vs. New Jersey, 38 saves), en route to being named the NHL's First Star of the Week for the period ending October 21 after posting a 3-0-0 record, 0.66 goals against average, .982 save percentage and two shutouts over the span. In his final full season with Buffalo in 2005-06, Biron won 13 straight starts from November 15 vs. New Jersey to December 17 vs. Pittsburgh, registering a 2.51 goals against average and a .915 save percentage in those games. He was named NHL Defensive Player of the Week for the period ending October 26, 2003, posting a 3-0-0 record with a 1.92 goals against average and .940 save percentage. Later that season, he earned his 100th career win with a 23-save shutout on March 29 vs. Columbus. Biron made his NHL debut on December 26, 1995 at Pittsburgh, earned his first career victory on March 5, 1999 vs. Dallas and recorded his first NHL shutout on November 19, 1999 at Atlanta. In post-season play, Biron has posted a record of 11-12 with a 2.87 goals against average, .908 save percentage and two shutouts in 23 career contests with Philadelphia. He led the Flyers to the Eastern Conference Finals in 2008, registering a 9-8 mark with a 2.97 goals against average and one shutout in 17 games. His nine wins and 17 appearances both ranked fourth in the NHL. The 6-3, 180-pounder appeared in 29 games with the New York Islanders last season. He finished the season on a 7-3-1 streak and posted two shutout during the campaign. He recorded 30-plus saves in 10 games, including a 38-save shutout on October 31 vs. Buffalo (5-0), which was also his 200th career victory. Biron tallied a season-high, four-game winning streak from March 25 vs. Calgary to April 6 vs. Montreal, registering a 2.45 goals against average and a .915 save percentage over the span. He also made his 450th career appearance on December 27 at Philadelphia. The Lac St. Charles, Quebec native was originally Buffalo's first round choice, 16th overall, in the 1995 NHL Entry Draft.